The Bethel Baptist Association of Georgia assembles today, near Albany. 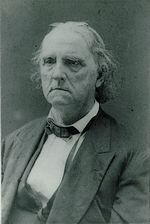 Following an “Introductory Sermon” from Acts 1:8 (“But ye shall receive power, after that the Holy Ghost is come upon you: and ye shall be witnesses unto me both in Jerusalem, and in all Judaea, and in Samaria, and unto the uttermost part of the earth.” KJV), a resolution to pray for the Confederacy is voted and acted upon. Whereas, our common country is engaged in a terrible conflict with a formidable and hostile foe, and whereas, our hope of success is founded alone in the favor of the God of battles, therefore resolved, that this Association will devote thirty minutes at the opening of each days session, to special prayer for the blessings of early honorable peace. The delegates thus spend half-an-hour in prayer, as they do each day of the four day meeting. These and many other Southern Baptists, embedded and invested in the culture of the South, frequently call upon God to bless His Confederacy. On the other hand, most Primitive Baptists of the South and the North, hearkening from a strict Calvinist and separatist framework, formally ignore the war raging outside the doors of their churches. For Primitive Baptists, internal theological purity is of greater concern, as illustrated in an except from a sermon from Matthew 7:6 (“Give not that which is holy unto the dogs, neither cast ye your pearls before swine, lest they trample them under their feet, and turn again and rend you.” KJV), published in today’s edition of the Primitive Baptist Publication, “Signs of the Times,” by Elder Gilbert Beebe, a long-time pastor in New York state. The admonition of the Lord in our text then clearly means that his disciples shall not give, nor minister the gospel, or its provisions, its promises, its comforts, its ordinances, or any of its commands, to any who are thus designated dogs, or who are in nature, disposition, practice or appetite as unlike the regenerated and spiritual people of God as dogs are unlike and inimical to the sheep and lambs. The gospel is food to the saints, because it is Christ; the preaching of the gospel is preaching Christ, and it is food to the spiritual, and hence the ministers of the gospel are commissioned to feed the sheep and feed the lambs; to feed the flock of God which he hath purchased with his own blood, but charged to give not that which is holy (and the gospel and all its ordinances are holy) to dogs. Dogs have no use for holy things, they can do them no good, for they are not adapted to their nature or suited to their appetites; besides, it is a desecration of holy things to give them to dogs or to swine. It is true, that the Gospel is to be preached to every creature, to all nations, and in all the world, for a witness to all nations, but only those who have ears to hear can hear what the Spirit saith to the churches. The ministers of Christ have nothing but the Gospel to preach, and that they must preach wherever God is pleased to open a door for them to preach, and its effect will be to discriminate between the living and the dead. All who have been pricked in the heart by the life-giving power of the Spirit will gladly receive the Word, as did the quickened on the day of Pentecost, while all others will mock and reject the testimony. But what we understand as being intended by this admonition, is that we are forbidden to attempt to Christianize unregenerated men, by teaching them the letter of the Word, and applying to them the ordinances of the Gospel as a means of salvation, by Catechisms, Bible classes, Sunday Schools, etc…as though we could so improve their carnal minds as to make them acceptable to God, without being born of the Spirit. According to our understanding of the subject, every effort to apply the things of the Spirit of God to unregenerated men, is to give that which is holy to dogs. Theological institutions for giving ministerial qualifications to graceless youths for preaching, and to unrenewed children and adults for church membership, and for evangelizing the world by humanly devised plans and schemes, is an attempt to give that which is holy to the dogs, and is clearly a transgression of the authority of our Lord, and an open violation of the words of our text: “Give not that which is holy unto the dogs, neither cast ye your pearls before swine.” It is not in the nature of swine to appreciate the value or beauty of pearls any more than it is the nature of dogs to relish the rich pasture on which the sheep feed. The children of God are in possession of jewels of inestimable value, which none but the children of God can appreciate or enjoy. Their spiritual privileges, their Christian love and fellowship, their gifts and graces, their experimental joys and peculiar exercises, their knowledge of divine things, are all pearls of great value to them, but their excellency cannot be known or appreciated by those who know not God. There is a fitness and utility in exhibiting these pearls among those of like precious faith, but those who have never possessed them would rudely trample on them if cast before them, as swine would trample upon the most costly and precious jewels. Indeed, Primitive Baptists are not well represented, if at all, among Baptist army missionaries who seek to convert soldiers. Nor do Primitive Baptist Associations, with few exceptions, in their meetings set aside time for prayer for their country. For his part, Beebe speaks only little, in his extensive writings, of African slavery. Consistent with the Primitive Baptist conviction of approving only that which is expressly allowed in the Bible, the New York pastor condemns abolitionism and notes that slavery is sanctioned in scripture. Of the war, Bebee seemingly makes no mention.